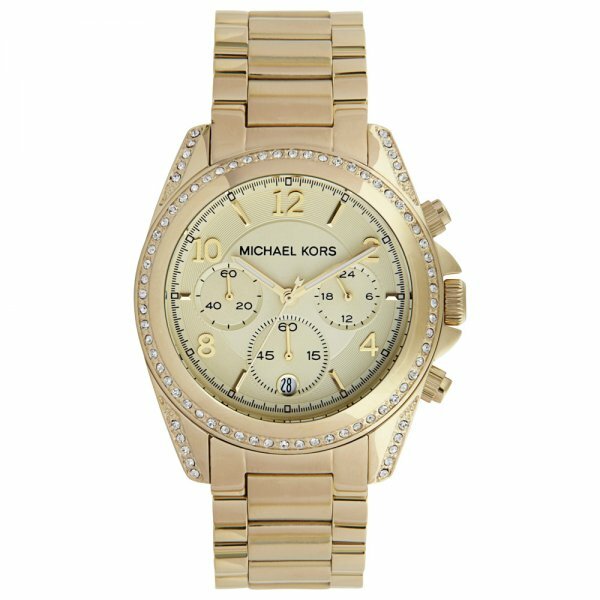 Michael Kors MK5166 Blair Ladies Gold Watch. This Ladies PVD plated Michael Kors designer watch is the ultimate in designer watches. The MK5166 Ladies watch has a desirable PVD plated case with PVD plated strap. The champagne dial is patterned and textured, giving a beautiful and elegant feeling to the watch. Also 46 clear stones surround the bezel adding a further touch of class. Further more the watch also features a date display window, fully operational chronograph and is water resistant up to 100 meters. This watch is manufactured to the highest standards, with quality and attention to detail in mind. The MK5166 Michael Kors ladies watch comes complete with a Michael Kors Watch presentation box.